Russian-American author and professor of biochemistry at Boston University, Isaac Asimov, was born January 2, 1920, he is best known for his works of science fiction and for his popular science books. Isaac Asimov was one of the most prolific writers of all time, having written or edited more than 500 books and an estimated 90,000 letters and postcards. His works have been published in all ten major categories of the Dewey Decimal System (although his only work in the 100s—which covers philosophy and psychology—was a foreword for The Humanist Way). Asimov is widely considered a master of hard science fiction and, along with Robert A. Heinlein and Arthur C. Clarke, he was considered one of the “Big Three” science fiction writers during his lifetime. Asimov’s most famous work is the Foundation Series; his other major series are the Galactic Empire series and the Robot series. The Galactic Empire novels are explicitly set in earlier history of the same fictional universe as the Foundation Series. Later, beginning with Foundation’s Edge, he linked this distant future to the Robot and Spacer stories, creating a unified “future history” for his stories much like those pioneered by Robert A. Heinlein and previously produced by Cordwainer Smith and Poul Anderson. He wrote many short stories, among them “Nightfall”, which in 1964 was voted by the Science Fiction Writers of America the best short science fiction story of all time. Asimov wrote the Lucky Starr series of juvenile science-fiction novels using the pen name Paul French. Asimov also wrote mysteries and fantasy, as well as non-fiction. Most of his popular science books explain scientific concepts in a historical way, going as far back as possible to a time when the science in question was at its simplest stage. He often provides nationalities, birth dates, and death dates for the scientists he mentions, as well as etymologies and pronunciation guides for technical terms. Examples include Guide to Science, the three volume set Understanding Physics, Asimov’s Chronology of Science and Discovery, as well as works on astronomy, mathematics, the Bible, William Shakespeare’s writing and chemistry. Asimov was a long-time member and Vice President of Mensa International, albeit reluctantly; he described some members of that organization as “brain-proud and aggressive about their IQs.” He took more joy in being president of the American Humanist Association. Such is Isaac Asimov’s influence on popular culture that Many things have also been named in his Honour including The asteroid 5020 Asimov, a crater on the planet Mars, an Elimentary school in Brooklyn, New York and the Isaac Asimov literary award. Most of Asimov’s robot short stories are set in the first age of positronic robotics and space exploration. 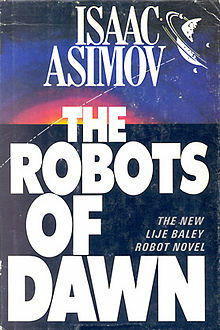 The unique feature of Asimov’s robots are the Three Laws of Robotics, hardwired in a robot’s positronic brain, which all robots in his fiction must obey/follow, and which ensure that the robot does not turn against its creators. The stories were not initially conceived as a set, but rather all feature his positronic robots — indeed, there are some inconsistencies among them, especially between the short stories and the novels. They all, however, share a theme of the interaction of humans, robots, and morality. Some of the short stories found in The Complete Robot and other anthologies appear not to be set in the same universe as the Foundation Universe. “Victory Unintentional” has positronic robots obeying the Three Laws, but also a non-human civilization on Jupiter. “Let’s Get Together” features humanoid robots, but from a different future (where the Cold War is still in progress), and with no mention of the Three Laws. The multiple series are interconnected in some way. The first four robot novels The Caves of Steel (1953), The Naked Sun (1955), The Robots of Dawn (1983), and Robots and Empire (1985) make up the Elijah Baley (sometimes “Lije Baley”) series, and are mysteries starring the Terran Elijah Baley and his humaniform robot partner, R. Daneel Olivaw. They are set thousands of years after the short stories, and focus on the conflicts between Spacers — descendants of human settlers from other planets, and the people from an overcrowded Earth. “Mirror Image”, one of the short stories from The Complete Robot anthology, is also set in this time period (between The Naked Sun and The Robots of Dawn), and features both Baley and Olivaw. Another short story (found in The Early Asimov anthology), “Mother Earth”, is set about a thousand years before the robot novels, when the Spacer worlds chose to become separated from Earth. Because many of the Robot novels were written prior to 1962, they were not eligible for science fiction awards, such as the Hugo. However Robots of Dawn was nominated for both the Hugo and Locus Awards in 1984, and Robots and Empire was shortlisted for the Locus Award for Best Science Fiction Novel in 1986. Asimov sadly passed away 6 April 1992 but has left a rich legacy of science-fiction novels. January 2 has also been declared National Science Fiction Day by many science fiction fans in the United States to commemorate Isaac Asimov and although It is not an official holiday as such, As it is not recognized or declared by any government, it is a good excuse to watch loads of Science Fiction including Star Wars, Star Trek, and read loads of Isaac Asimov stories.